Walking SA encourages Councils to improve walking conditions in urban areas to help people walk and cross safely and directly while at the same time keeping traffic moving. 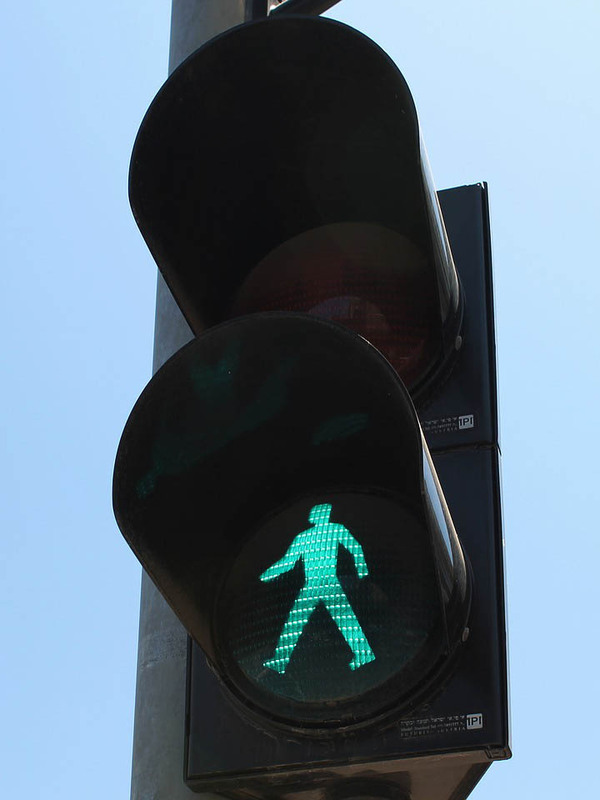 Walking SA calls for the development of state-wide pedestrian traffic signal guidelines. Walking SA calls for councils to review pedestrian signal phasing at intersections and crossing points in busy pedestrian areas, in order to reduce pedestrian wait times. Many traffic lights in South Australia discourage walking because their location and management is based on the overriding priority of promoting traffic flow. Frustrations for pedestrians at traffic signals can occur due to long delays between pressing a button and being given a walk signal at pedestrian crossings, very long cycle times at intersections and pedestrian crossing times that can be shorter than is necessary to safely walk across the road. People “jay walk” when the traffic is clear but the Red Man still given. A survey by Gehl Architects found that a third of the time walking the length of King William Street was spent waiting for lights. Traffic signals are designed to prevent conflicts between road users by separating in time those users with conflicting routes: most commonly at intersections, but also at mid-block pedestrian crossings. Australian traffic engineers have led the world in coordinating traffic signals in a network so that drivers can experience a series of green lights if they travel at appropriate speeds. Australian traffic engineers have also pioneered the ability of traffic signals to adapt to varying traffic flows in real time. While the network approach has been effective in minimizing delays for motorists on arterial roads through the suburbs, it has negative consequences, particularly for pedestrians. Most obviously, if it is not possible to cross a road safely, people will be discouraged from walking, but also from using public transport as stops are typically located on either side of a road. If the timing of pedestrian signals is then set to minimize delays for traffic, pedestrian crossings will not be responsive to pedestrians wanting to cross. This is especially the case at mid-block pedestrian crossings for which no traffic cross-flow exists. Pedestrians are required to push a button and then wait for a crossing time that fits in with the management of intersections down the road. Also the time allowed to cross will be minimized so as not to upset the traffic flow. In recent years Adelaide has experienced at least two elderly pedestrians being hit (and one killed) because they could not complete the crossing in the time allowed. A similar effect is created with staged crossings, where pedestrians cross part of the road and may have to wait in an island for an entire signal cycle before being able to cross the remaining part of the road. In road safety practice, excessive delay is recognised as contributing to risk by encouraging road users to travel against the signals, yet this is commonly ignored in Adelaide’s management of pedestrian crossings. Coordinating traffic lights is problematic in a grid where there is no advantage to prioritising one flow over another. This is the case in Adelaide’s city centre, where there are high numbers of pedestrians, who should have a strong claim for priority in traffic management. This after all, is a location where local amenity should be emphasised, rather than through movement of traffic. Instead, attempts to coordinate traffic signals can result in traffic light phases established by conditions at the busiest, widest intersections, leaving pedestrians (and motorists) at smaller, quieter intersections waiting unnecessarily. For example, the time waiting for a green man to cross Pirie Street is determined by crossing times on North Terrace. It appears that traffic signal management is determined by the perceived need to minimise traffic delay, irrespective of whether that traffic should be encouraged or not. For example, the City of Adelaide has no traffic management plan to guide traffic engineers. The result is that traffic flowing out of the city in the morning peak (“rat runners” using the City as a through route) have priority over people walking into the City to work and study. We need traffic light phasing that reflects the needs of different road users, particularly where we want to increase the use of a wider variety of transport modes. In addition, we need to prepare for an era of smart and responsive design by considering how best to share and prioritise appropriately between all road users. Walking SA supports the development of state-wide pedestrian traffic signal guidelines, to ensure a consistent and understood approach. determining times, locations and circumstances where pedestrians should have priority over through traffic.The need for coordination of traffic lights for pedestrian convenience should be reconsidered, and traffic light phasings should be shortened.For example traffic cycles are typically longer than other “pedestrian friendly cities” at 120 seconds or more. London operates on a maximum 70-second cycle. Pedestrians crossing mid-block on arterial roads out of peak periods should not have to wait for the lights to respond. We recommend an immediate green if the button has not been pressed recently. Use of treatments at specific wide intersections to minimise crossing distances. This can include kerb build-outs to reduce the widths of roads and centre median resting places for slower pedestrians. Identifying crossings where smart technologies can improve the pedestrian walking experience. Using technical developments such as Singapore’s Green Man Plus, which enables those who need longer crossing times to call a longer green period.The recent adoption of count down buttons has dramatically expanded pedestrian crossing times, improving the pedestrian experience. However there are still many intersections where this feature Is not available. an audit of traffic lights, to ensure that phasings are set to maximise pedestrian crossing time within any one signal and that pedestrian delay is at levels that would not encourage pedestrians to cross against the green, and action on these audits.For example, the Austroads Guide to Traffic Management states that the green man should be at least six seconds in each phase. Too often this has been interpreted as the default crossing time, rather than the minimum. Collecting data and setting targets for “pedestrian time saved” at signalised crossings. Considerations of safety. Methods such as communications for drivers and walkers may be needed to educate the public about changes to the system. Position statement as at September 2018.